Tried a few new techniques in a class tonight, first was making a background with marbles and re-inkers...I like the look of it and it's so simple. Drop some re-inker into a plastic container, roll the marbles in the ink, add the paper, roll the marbles on the paper, let it dry...couldn't be easier. 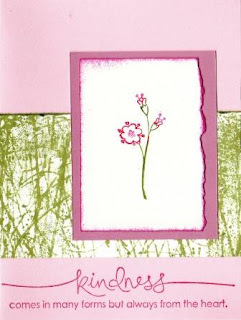 This card used kiwi kiss on the marbles and a new SU set called sweet stems.